This article is to help you better understand forward head posture and how to fix it. It’s primarily a musculoskeletal condition that is reaching epidemic levels. Most healthcare practitioners are pointing to increase use of technology. The technology comes in the form of laptops and cellphones contributing to poor posture. 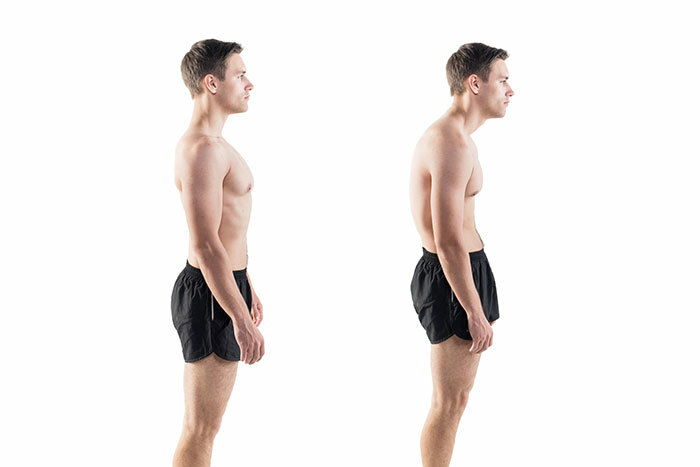 Forward head posture is one piece of a whole body posture break down. It’s most obviously seen when a person sits or stands but can also be seen if you’re lying down with a pillow under your head causing the head to be elevated. 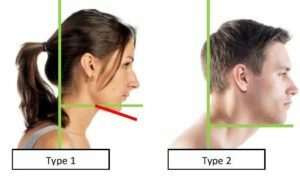 Type 1 is seen as the head forward and the chin is dropped below the horizontal plane. This is described as the head being forward and in flexion. The tiny muscles that connect your skull and spine could be hypertonic or overly tight. This plus the misalignment of either the first (atlas) or second (axis) cervical vertebra of the spine will cause a compression of the blood and nerve supply. The body’s reaction is to dilate the blood vessels in the head to increase blow flow. The sensation of this response is a headache. Depending on whether the head is in flexion or extension the TMJ must accommodate due to the muscular imbalance in neck, head and jaw. Malocclusion such as an overbite or underbite can occur which is why many orthodontists advise patients to seek realignment of the neck before performing orthodontic work. Direct TMJ problems can also occur and result in clicking or pain with chewing. The average weight of an adult head is 8 lbs and the forces that apply to the neck from holding the head in a forward position can translate into 30 lbs of abnormal forces into the neck! This kind of force demands the body to react by tightening and constricting muscles and tissues to compensate. The result would be stabbing, throbbing pain, numbness or tingling in arms and hands. In many cases I have found many clients did not realize, until after the examination, that weakness had developed in the neck, shoulder, arms or hands. The effects of forward head posture can also cause the entire body’s center of gravity to be forward, increasing incidence of falling – something we see in the elderly. Research studies show the connection between the misalignment of the upper neck and high blood pressure (1). Due to the compression of nerves and reduction of bio-mechanics, there can be a 30% loss of lung capacity (2). Slouching wastes more energy, thereby causing you to experience a loss of energy and productivity. From the perspective of bio-engineering the human body is a complex living mechanism that is subject to all the same forces as a building. The greatest difference between us and a building is we have a built system to constantly be in adaptation to external forces, like gravity. But like a building we are susceptible to the effects of gravity over time as well as degradation. Accidents and injuries that we sustain anytime from birth forward can cause tearing of tissue around the joints of the spine. When we “heal” we don’t return to exactly the same state. Scar tissue can form and points of instability can develop. The combination of wound healing with the effects of gravity result in a break down pattern of the spine. The break down pattern when seen in the neck and upper back is called Forward Head Posture. It is the result of the weight of the head pushing down on the neck and the body not being able to resist due to a point of instability in one or more joints in the neck. There are four categories of treatments and remedies to fix forward head posture. Remember, beginning any program to treat or relieve the symptoms of forward head posture, it is necessary to seek advice from a medical professional to avoid exacerbating the pain or aggravating another medical condition. This is all about lengthening shortened muscles. Muscles can atrophy and constrict from either a lack of use or not enough use. I suggest two people to look into. One is a massage therapist who is a trained Rolfing practitioner. They can do amazing things to lengthen shorten muscles through manual massage. The second person I recommend is in Iyengar yoga for its rehabilitative nature. A certified practitioner can lead you through gentle posture to open restricted muscles. Strengthen weak muscles is the goal here. Over time poor posture results in a entire set of weak muscles as part of the break down pattern. You need to find a system of exercise that focuses on posture muscles. I suggest looking into pilates or finding a training center with a certified Chek Institute trainer. 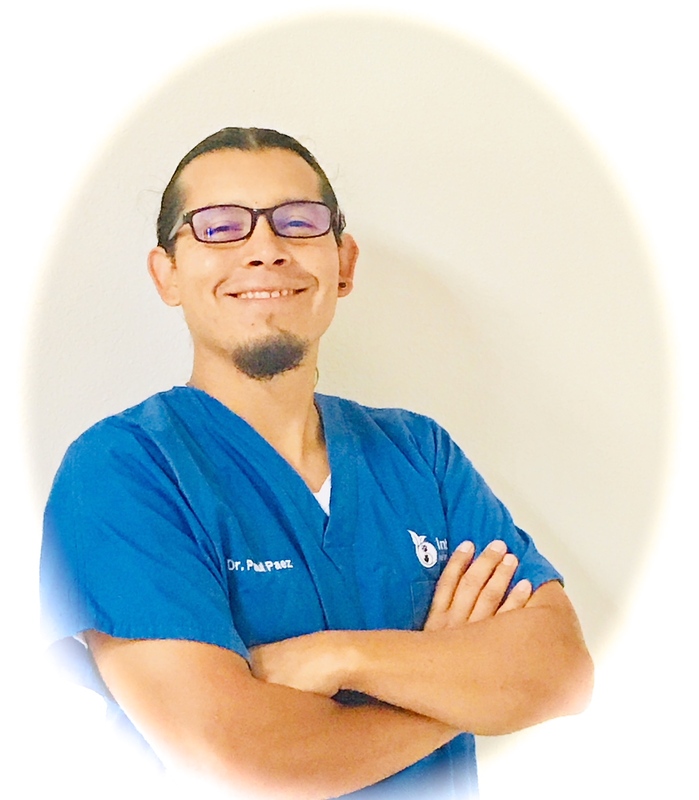 Both of these types of physical therapy have a high degree of sophistication in their understanding and approach to the human body and how it functions. The number one place to change your lifestyle habits is at the computer. Ergonomics is the study of our position at a workstation. It’s worse making changes to your desk computer, the amount of time you spend on it and re-evaluating the use amount of your cell phone. Check out my article on improving your posture at your desk. prolonged sitting causes the bodies metabolic function to be inactive. the joints stop moving, the muscles aren’t firing and the heart rate slows down. “then, the body’s calorie-burning rate plummets to about one calorie per minute—a third of what it would be if you were walking. Insulin effectiveness drops and the risk of developing type 2 diabetes rises. Fat and cholesterol levels rise too (3). There are many practitioners out there who can help with your health but there are just a few who specialize in improving forward head posture. I would recommend looking at these three practitioners but you must dig deeper in your inquiry to find out if they specialize in posture correction. Forward head posture has become more widespread with the escalating use of texting and computer use. It’s a condition that not only affects your health but also how you move and look. The good news is forward head posture, with the right guidance and effort, can be corrected!